In the best-case scenarios, educators are able to use data to assess student performance so that they can better plan, implement and revise instruction. Research shows that if instructional plans are based on assessment data, it’s more likely that students will attain the desired learning outcomes. In reality, however, using data is not so easy. Teachers and administrators need to be data literate. District leaders must encourage and assist educators in understanding the importance of relating valid student assessment information to instructional practice. And perhaps trickiest of all, the school culture needs to be one in which teachers can collaborate, share information, and not be intimidated by what the data may show. School CIO spoke with a few districts to see where they are in the data-driven decision-making process. Hopefully their experiences can help you in handling your own data-driven decisions. For Donna Lee Mitchell, deputy officer, teacher and leader effectiveness unit for professional development for the Delaware Department of Education (DDOE), there’s a twoword answer to helping districts understand how to work with data: data coaching. 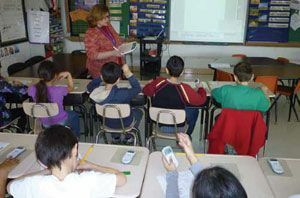 With part of the state’s Race to the Top funds, DDOE contracted with Wireless Generation (www.wirelessgeneration.com) to send 29 data coaches to work with teachers in all of Delaware’s schools. Data coaches work with groups of teachers who look at their own data in real time. The coaches show teachers how to speak about data and use it to draw conclusions and improve instructional planning. The educators learn how to understand patterns and find and evaluate the solutions. If it’s done right, says Wireless Generation’s Alan Stadtmauer, the coach coaches herself out of a job. Each school has to provide 90 minutes of collaborative planning time a week per teacher, which is handled differently by every school, says Mitchell. The data coaches work with data from state and classroom assessments and help teachers and administrators learn to look at it and make informed decisions about planning, practice, and activities beyond what they are currently doing with data. They can see which strategies work better than others and share best practices across grades, departments, and schools. Delaware has a statewide student accounting system that houses discipline, achievement, and attendance information so the coaches can work with several schools. If a district uses an additional technology product, the entire district uses it, which helps to streamline the tools the coaches and educators need to understand. Wireless Generation’s Stadtmauer, who oversees data coaching, says this method is effective because teachers are overwhelmed by data and need a simple approach. “They have to learn how to figure out what to do next. It’s a core skill teachers need.” We must help teachers learn how to look for patterns across an entire class. About 10 years ago, Cumberland County Schools (CCS) in North Carolina formed its own data warehouse. Because NC has a statewide student information system, CCS wanted to download the data for the statewide student information system (SIS) and store it in a centralized place where people could track data for any given student. The district also needed to merge assessment and other types of data with the SIS data. CCS worked with eScholar (www.escholar.com) to create a data warehouse. Today, that warehouse includes school enrollment, staff demographics and certification, attendance, discipline, and item-level assessment data for individual students. Principals use the data for planning; teachers use it to track student performance on skills and objectives and provide targeted instruction. When it became available, the district started using eScholar myTrack, which lets teachers use data to personalize education. eScholar myTrack capitalizes on the data in the warehouse and provides teachers with recommended strategies and interventions that are aligned with state and local standards. It lets them create goals and strategies, monitor and measure progress, and evaluate the effectiveness of those programs and interventions. A teacher logs into the system, enters a student ID, and gets all the data collected on that student. The teacher reviews the information and creates a plan within the same program to pinpoint areas by goal and objective and develop academic and, if needed, behavioral interventions. The teacher can select predetermined interventions based on success rates reported in the system or create new ones. For the last couple of years, Marion County (FL) Public Schools was busy upgrading its earlier data system to be more robust and comprehensive. The district needed a system that was quicker, more user friendly, and would provide more access to data to support decision making at all levels. It also added a component that connects student data to teacher actions. According to Greene, the district wanted a system that would allow for online testing and the ability to make decisions about how well students were doing throughout the year. They chose Performance Matters (www4.performancematters.com/web), which lets teachers access the information easily to see how individual students and whole classes are performing. A technician converted benchmark data into predictive Florida state test scores so staff can predict how well a student will do on the state test. Once schools get the information, they can develop an action plan based on the findings. Essentially, Performance Matters helps everyone make decisions about what is best for students. When they saw that every third-grader struggled with authors’ intention, they realized the curriculum was teaching it one way and it was being tested another way, so they did additional staff development and made some changes. The teachers at Salt Creek 48 (IL) School District have been using eInstruction CPS student response systems to conduct formative assessments for a while, but they recently starting using ECRA Group’s valueadded growth model for more long-term program decision-making. ECRA Group (www.ecragroup.com) is a consulting firm that helps schools develop research-based analytic solutions to help link student performance to teacher and administrator evaluations and document return on investment for programs and interventions. Salt Creek is using ECRA Group to predict with a high degree of accuracy what a child will do, all factors being equal. “When we evaluate programs on a longterm basis, it’s nice to see if our interventions are working or making things worse,” says Mark Hupp, director of technology. Recently, an evaluation revealed that one intervention strategy seems to be working. He says that the ECRA rep shared results from a recent high-stakes test and a group of third-grade math students’ results were off the charts. The teacher driving those changes uses eInstruction CPS SRS every day. What Are Districts Saying About Data? Gartner, Inc., surveyed district leaders, school leaders, technology leaders, and teachers across the country to gauge their attitudes toward the data housed in SIS and LMS solutions. Closing the Gap: Turning SIS/LMS Data into Action also discusses how schools are using this data to improve classroom practice and student learning. Here are some of the findings from the survey. 53% of teachers using LMS solutions and 61% of those using SIS solutions feel unsure how to best integrate the data into classroom instruction. 80% of school leaders report using the data from their SIS/ LMS solutions to make curriculum and academic program and policy decisions to impact student learning. 37% of school leaders are dissatisfied with their installed SIS solution. 35% of school leaders report being satisfied with their SIS solution. 92% of district leaders report using the data from their SIS/ LMS solutions to make curriculum and academic program and policy decisions to impact student learning.